"These are NOT your grandma's pumpkin seeds! Smokey, sweet, and wonderfully delicious." See the three simple steps to roasting pumpkin seeds. Homemade bacon bits can be added as well as a light sprinkle of cayenne pepper if you like a bit of heat. If you hate the idea of getting rid of 1/2 cup of whiskey as much as I do, drain the liquid mixture into a small sauce pan and reduce to about half. Then when the seeds have roasted about 1/4 of the way, drizzle the sauce over them. The nutrition data for this recipe includes the full amount of the whiskey sauce. The actual amount of the sauce consumed will vary. I didn't change anything in the recipe, just doubled it and they're DELISH! 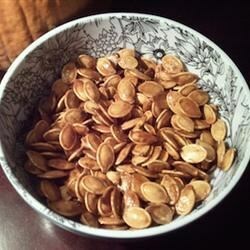 One do the best roasted pumpkin seed recipes I've found. Being from KY, we love our bourbon. I made for a Thanksgiving Day snack, but I doubt they'll last that long! Completely awesome! Made these for a work party. Addictivly good! I added some smoked chipolte sauce to the boil for a little extra kick! I also did the cayenne pepper, everyone loves it!